75 faithful gathered at Sacred Heart University to defend God's holy law. Before Fr. James Martin, S.J. delivered his pro-homosexual talk at Sacred Heart University in Fairfield, Connecticut, TFP Student Action volunteers along with more than 70 faithful Catholics and two priests gathered outside the campus for a peaceful and prayerful protest on January 26. TFP Student Action had already launched a petition asking the president of Sacred Heart University to cancel Fr. Martin's January 29 lecture, which was held inside the Chapel of the Holy Spirit. The petition garnered 19,593 supporters, an indication that concerned Catholics firmly disapprove of Fr. Martin's attempt to distort Church teaching and normalize homosexual sin within the Church. The president of the university, Dr. John Petillo, in a letter to faculty, staff, and students complained about TFP's peaceful effort to uphold God's law: “There has been an outpouring of letters, emails, and calls regarding Fr. Martin's views. Some have been respectful, but mostly they have been, I feel, laden with bigotry and self-righteousness,” he wrote. Without addressing the substance of the issue, Dr. Petillo charged TFP Student Action with one of the newly-minted unforgivable "social justice" sins: bigotry. It is not clear what Dr. Petillo means when he says "extolling biblical passages to justify bigotry." Perhaps he felt challenged by TFP Student Action's post entitled What the Bible Really Says on Homosexuality in 5 Quotes, featured on the petition page. Repeating the same talking point of the homosexual movement, Fr. Martin condemned the Catholics who stood in the bitter cold as being "hateful," while they prayed the rosary in reparation to the Sacred Heart of Jesus and the Immaculate Heart of Mary, singing hymns in honor of the Blessed Virgin Mary. Due to the fact that Sacred Heart University is located at a busy intersection, many people driving by expressed their support with thumbs-up and honks, showing that we are not alone in our love and fidelity to the Church's moral teaching. On the night of Fr. Martin's talk, January 28, another peaceful protest was held in front of the university by brave Catholics who stood up for the truth. The Catholics who gathered at the university had a clear message: Charity and truth are inseparable. And purity is the answer. Fr. 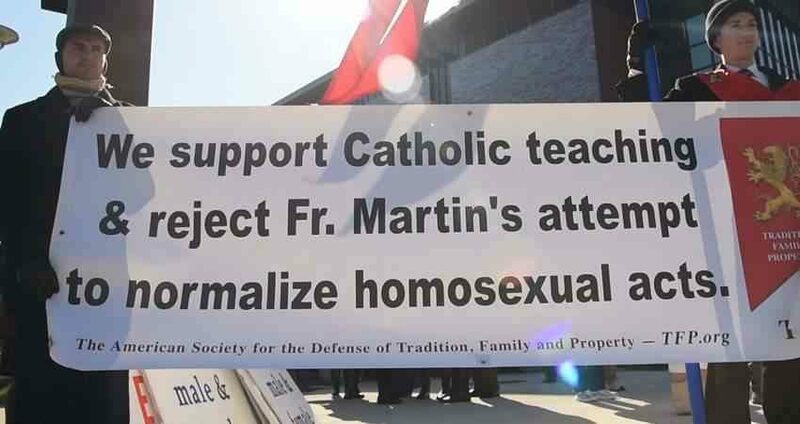 Martin must not lead souls astray by promoting the unnatural sin of homosexuality; and until he stops, we will continue to peacefully protest his efforts to subvert Catholic doctrine, and we will continue to make reparation for his offenses to Our Lord.